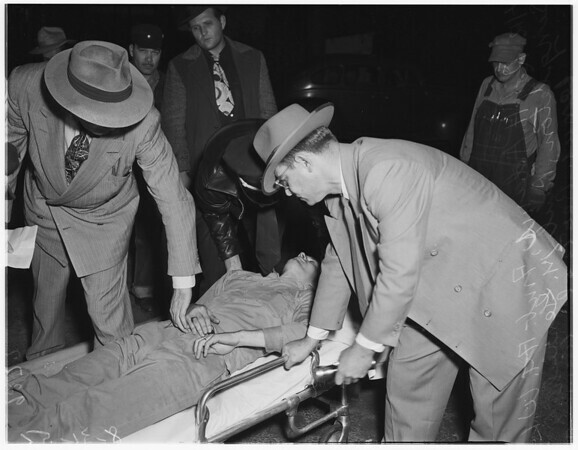 and Paul M. Genrich, Santa Fe Special Officer place the unconscious form of Lanus Bertsch, injured fireman, on a Georgia St. Hospital stretcher. B47: Ambulance attendants Paul Schwartz, and James Owens from Georgia Street Hospital with fellow railroad workers of the injured man, give emergency treatment to Leo C. McKinney, who suffered a deep gash in his chest, and other injuries. He had just been taken from the cab of the switch engine. Second from the left is Russell Roland, Yardmaster".